See the attached link. 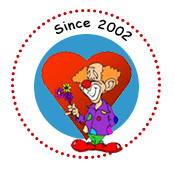 The story on Caring Clowns International begins on/about Page 14. It’s a large PDF file in the middle of the page and you’ll have to click the forward button to get to Page 14. Thanks to the World Clown Association for helping tell our story to clowns around the world! !